Oregonians for Medical Freedom – Senator Steiner Hayward’s SB 673: Drilling for Mandatory Gardasil Shots for 11 year old Kids? We were as confused as you probably are right now. 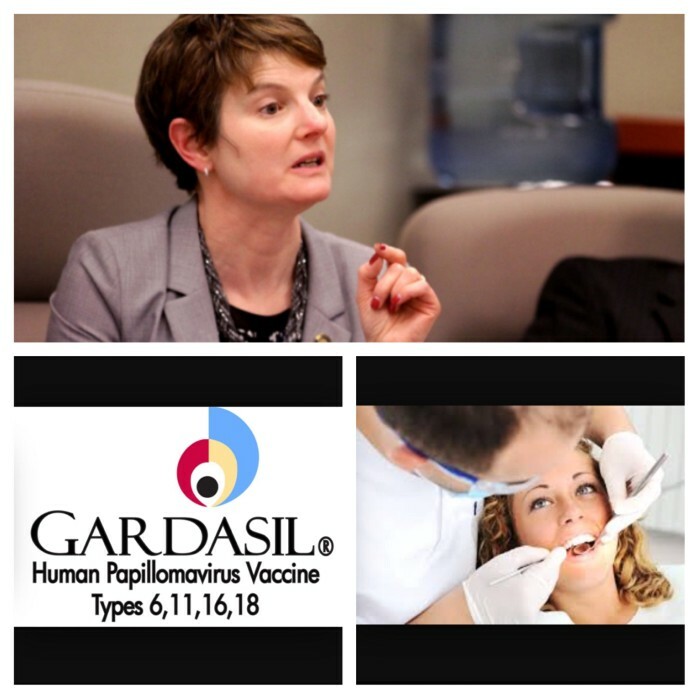 What does a 2015 Senate Bill introduced by Oregon State Senator Elizabeth Steiner Hayward — SB 673 — proposing to allow dentists to dispense and administer vaccines have to do with mandatory HPV vaccinations (Gardasil) for adolescent girls and boys? Senator Elizabeth Steiner Hayward is not your average Oregon State Senator. Appointed — not elected — to her current position in 2011, Senator Steiner Hayward, herself a family doctor, is proving to be Big Pharma’s best friend, introducing a slew of legislation that appears designed to improve the revenues of pharmaceutical manufacturers, particularly for vaccines. Directs Oregon Health Authority to conduct study assessing activities related to human papillomavirus [HPV] and to prepare human papillomavirus and comprehensive related cancer comprehensive control plan as addendum to Oregon Comprehensive Cancer Plan. Declares emergency, effective on passage. Now, before you ask some of the many questions we asked when we saw this bill, like, “Why was this an emergency?” or, “Is this a bald-faced attempt to justify mandating the HPV vaccine?” we’d like to start with one of our biggest punchlines of this whole article, which is an excerpt from the study OHA actually produced in response to Senator Steiner Hayward’s bill, as they were directed to do. Lower the age of consent from 15 years to 11 years? Allow “more adolescents to be vaccinated in a school setting or other venues where parents might not be present”? Did the OHA really recommend that? Yes, they wrote that, too. Misperceived. OHA’s third recommendation in their report is to, “Require HPV vaccination for school attendance.” Does Steiner Hayward’s previous vaccine bill — Senate Bill 442 — start to make a little more sense now? It would have made all shots mandatory for school attendance. Earlier in the report, OHA also recommends working with “non-traditional partners” including DENTISTS, to expand the reach of HPV shots. Our study will be the first to engage dental-health providers as vaccination partners. A large challenge to vaccinating adolescents is that they have fewer routine medical visits than younger children. However, most adolescents receive preventive dental care at least twice a year. The study will occur in the Kaiser Permanente delivery system in Oregon and Washington (KPNW). If successful, the proposed intervention will lead to strong recommendations for vaccination from dental providers, fewer missed opportunities for vaccination, and increased vaccination coverage rates. Provider recommendation is a strong predictor of adolescent vaccine acceptance, particularly for HPV vaccination. Drs. Naleway and Henninger are long-time successful partners with the CDC in assessing adolescent vaccine uptake, safety, and effectiveness. Their work has improved understanding of factors associated with adolescent vaccine uptake and completion within our health-care delivery system, and has laid the foundation for the proposed intervention. Said differently, Drs. Steiner Hayward and Naleway see each other twice a month in their official capacity as Board Members on a Committee created by the Oregon Legislature. Senator Steiner Hayward, while promoting Senate Bill 442 which would have made all vaccines mandatory for all children in Oregon, was emphatic in public testimony that she never accepts money from pharmaceutical companies. Note: not reporting a donation you receive is a violation of campaign finance laws. 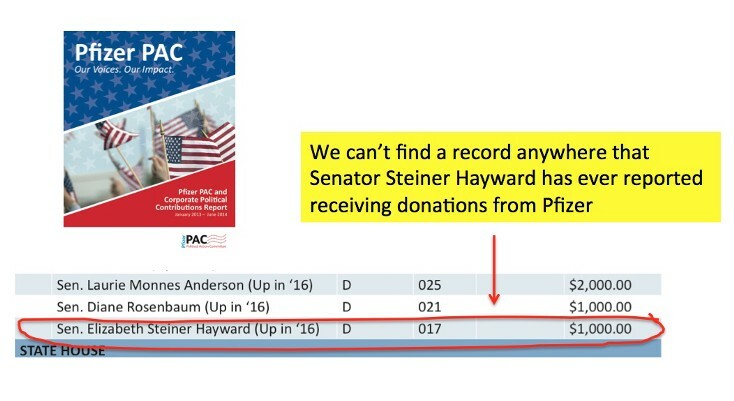 We can’t find the Pfizer donation in Senator Steiner Hayward’s reports anywhere, although perhaps we just haven’t looked in the right place. What to make of all this legislation and all these moving parts? Have we found a smoking gun here in Senate Bill 673? Do you remember the story about boiling a frog? 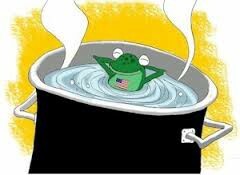 If you increase the heat slowly enough, the frog keeps re-acclimatizing to the higher temperature…and never knows its boiling until it’s too late. That’s how we view Senator Steiner Hayward’s growing body of vaccine legislation…it’s sneaking up on all of us. When we first heard about SB 673, our first reaction was, “Who cares?” If Dentists want to vaccinate, so be it. But now we realize that SB 673 is really about a single shot — HPV — and a single demographic: our children. We don’t like that. Lower the age of consent to 11? No thanks! At this point, any legislation by Senator Steiner Hayward with the word “vaccine” in it should be viewed with sneaking suspicion as industry-funded or industry-derived. Finally, we are working with Senator Elizabeth Steiner-Hayward (D-Portland) on a vaccination bill for dentists. Dr. Steiner-Hayward (an OHSU general physician), as a result of health care transformation, believes that dentists should be able to administer vaccinations within their own offices. This would be completely voluntary, and dentists would not be required to if it did not make sense in their office. However, for those that wanted to do so, they would be able to administer shots. Can you imagine if Senate Bill 442 had been successful in mandating all vaccines for all school-aged children? How long do you really think it would have been before HPV/Gardasil would have been added to the mandatory school schedule? Senate Bill 722, introduced in 2013, provided Senator Steiner Hayward with “cover” to mandate the HPV vaccines for children. OHA was required to produce a report that basically said, “Oregon’s children need this shot.” The report is ready to be used to justify the addition of the shot to Oregon’s mandatory schedule and it also introduced the idea of lowering the age of consent for our children from 15 to 11. Senate Bill 442 would have removed the right of parents to exempt out of any shots for their children, clearing the path for the HPV vaccine to be mandated. Senate Bill 673 simply creates another route for vaccinating children: at the dentist’s office. As Pfizer figured out, adolescents don’t go to the doctor as often as young children, but they go to the dentist twice a year. Since you can’t give the HPV vaccine before the age of 11, the dentist’s office is perfect. And, many more to come. Senator Steiner Hayward continues to hint at additional vaccination-related legislation she will be introducing. We hope you will share this article with your legislator so they have a better understanding of the background to some of her proposed bills. This study aims to evaluate two communication trainings for family medicine physicians and pediatricians to improve their perceptions and provision of Human Papillomavirus Vaccine. This intervention will train physicians to provide effective recommendations for the vaccine using participatory or efficient communication styles.